After our all too brief encounter (12 hours!) with the fascinating city of Shanghai, we again boarded the Diamond Princess and settled in for several relaxing days at sea. On the morning of the third day, our ship docked at Xingang, the closest port to Beijing. This was the final stop on our cruise, which had begun 16 days earlier in Bangkok. 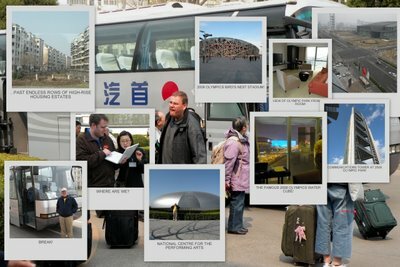 All 2,600 passengers disembarked here and headed for buses to travel the 100 km or so into Beijing. The buses themselves were Chinese-made and looked like modern tour buses, but they were laid out for little people; there was barely enough room for me to sit with my legs sideways. After a 20 minute wait in the bus, off we went – about two blocks. We sat and sat in traffic, just inching along. At one point, our bus stalled. The driver had to get out and start it again with a crank. Then he got lost and had to turn the bus around. Next, much to our horror, when he missed an exit ramp on an expressway, he nonchalantly backed up in heavy traffic. After about an hour of this unwelcome entertainment, we stopped at a restaurant for a toilet break. Three other buses had the same idea at the same time, making the line-ups for the toilets – two! – very long. These were traditional Chinese facilities; that is - holes in the floor! Duly relieved, off we went again, past endless rows of high-rise housing estates, and hundreds more under construction. Three hours later, we arrived somewhere in Beijing. After a half hour of waiting and negotiation, we managed to arrange for local transportation and were on our way again across town to our hotel, the Intercontinental Beijing Beichen. As it happens, this Intercontinental was built for the Olympics in 2008 and sits right inside the new Olympic Park, overlooking the famous Bird’s Nest Stadium and the aqua blue swimming centre known as the Water Cube. A beautiful hotel and a stunning location on Beichen Road! I had planned to attend a concert by the China National Symphony (conducted by Michel Plasson) on the evening of our arrival. I had seen it listed on the National Theatre website. I checked the website again after we had settled in, and also called in the very efficient concierge at our hotel for assistance, but the concert listing had disappeared! From our vantage point near the Olympic Village, Beijing appears very modern, with impressive highway and rail infrastructure. The traditional, however, is much in evidence here too. The morning after we arrived, we visited the hutong area of central Beijing. This is the older part of the city, featuring walled houses with inner courtyards, separated by narrow alleyways. Many hutongs have been demolished to make way for new high-rise buildings, but there is a campaign underway to preserve at least some of them to honor the architecture and lifestyle of ancient times in Beijing. I had hoped to see Red Cliff, the new Chinese Opera production directed by Zhang Yimou, one of China’s leading film directors (Red Sorghum, Raise the Red Lantern) and director of the spectacular show at the opening ceremony of the 2008 Olympics in Beijing; unfortunately, tonight’s performance of Red Cliff at National Centre for the Performing Arts was sold out months in advance!